This was long overdue. Most of you might have seen my blogger profile picture and would have noticed ETV logo in the same and might be wondering if it is a digitally tampered image…Trust me, it is not. Way back in 2002, I had participated in a television show and this post is to share with you the recorded video of the same and related details. 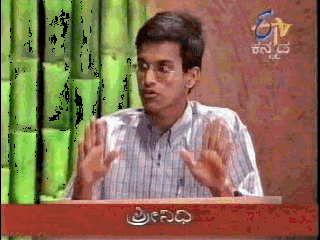 The program was titled Yuva Chavadi (Kannada for: Youth forum (not exactly though-chavadi means a place where people gather together and discuss)) It is basically a debate show. One topic is selected and people speak for and against it. There is no winners as such. The host, Aparna consolidates the points and ends the discussion. This show used to get telecasted every Monday night 10 pm and a repeat telecast next Monday. The topic was “is population explosion a boon or bane?” Pretty common topic on which one would have written hundreds of essays and given lots of speeches since childhood. I choose to say “Population Explosion is not a curse and is in fact an asset”. Defending that was a challenge given that we’ve been made to believe population is a curse for this country. Will publish English transcript soon. How did you manage to get this opportunity? It was a Friday during Jan/Feb 2002, I was glancing through Prajavani, the then most popular Kannada daily in Karnataka (Now Vijaya Karnataka leads). There was a small article which invited interested individuals to apply for a debate show on ETV. I used to consider myself good at debates and speeches hence applied. Few days later got a call to attend screening at Maharani Ammanni college Malleshwaram. I went there on the scheduled date and time, was asked to speak about population explosion, I spoke well and was told that result will be conveyed soon. Few days later I got a message that I need to call one concerned person and eventually I was conveyed that I’ve been selected for the show and I need to go to Kanteerava Studio at Laggere, Bangalore for recording of the show. I was also asked to bring any one or two of my friends as audience. After checking availability with couple of people, my JNVC classmate NR Bhat choose to join me. We traveled all the way to Laggere…and after waiting till evening, our turn came. I was participant in one of the episode and I also sat as an audience in one of the other episode. 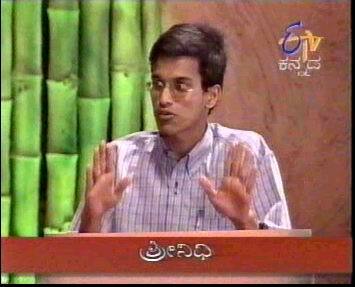 The show was eventually telecasted during June 2002. Did they give the CD containing the show? No. They didn’t even tell when it will be telecasted. I requested one of my relatives to record it for me. No. A gift voucher worth rs 250 which I could use to buy books at Sapna Book House. Plus free lunch and Rs 50 for conveyance. hiii gud dear,,,,,,,that too in that age!how did u come 2 know the mater dear,means how did u get invtn 4m ETC ppl to participate in that?????? ?